After a number of weeks, the registry entry arrived, and I learned that Joseph McAllister and Hannah Bell were married on the “Eighth of November 1845.” There were married in the Register’s Office with William Scott and Arin Bell as witnesses. I’ll bet Arin Bell was probably related to Hannah. The registry entry shows Joseph was a “Mariner” (I knew he was a sailor before). But most interesting I learned that Joseph’s father was Peter McAlister, a miller, and Hannah’s father was Jonathan Bell, also a mariner. As I have begun to get to know my Blackhurst heritage, I am amazed. It is an incredible group of people descended from 19th century English immigrants, Stephen and Fannie (Taylor) Blackhurst. Fifty years after Stephen’s death family reunions began. Their descendants include many community leaders including a superintendent of schools for St. Charles, Missouri. It is more amazing because until I began investigating this family line I had not hear of any Blackhurst ancestors. It was a name neither my mother nor her brother recalled ever hearing. They both remembered hearing about their great-grandmother Sarah Barber, who died when my uncle was only one year old, but neither recalled hearing Sarah’s maiden name. Of course, I wonder what caused my line to appear to have become estranged from the remainder of Blackhursts. I have my suspicions, but need to do a lot more research to prove them. In any event, in introduce you to my third great-grandfather, Stephen Blackhurst. Birth years are often contentious and Stephen’s birth year is no exception. He was certainly born sometime between 1799 and 1804. 1799 – His death in 1869 at the age of 70 suggests that he was born in 1799. 1800 – The 1860 Census indicates his age as 60, suggesting a birth year of 1800. 1801 – His marker displays 1801. Because there is no definitive source for his birth year, 1801 is the year I prefer to use. 1802 – The 1841 England Census indicates his age of 39, suggesting a birth year of 1802. 1804 – The 1850 US Census indicates his age as 46, suggesting a birth year of 1804. Other records indicate he was born in Sheffield, South Yorkshire, England. I believe Stephen was the child of Stephen Blackhurst and Lydia Ellen Cochran. I know nothing of Stephen’s childhood nor of his siblings. Stephen and Fanny Taylor married on 26 Dec 1825 in Rotherham, South Yorkshire, England. Rotherham is the district immediately east of Sheffield. It appears that the couple may have moved between Sheffield and Kingston upon Hull. Records indicate that their first child, Ellen, was born in Kingston upon Hull and five of the other children were born in Sheffield. There are two children that I don’t have any details on their birth locations and, of course, Ellen’s birth location is single sourced and may be incorrect. In any event, by 1841 the Blackhursts had located to Kingston upon Hull (known as Hull today), Yorkshire, England. The 1855 New York Census indicates that Stephen had come to America seven years earlier (1848) while his wife and three of his children had come to America five years earlier (1850). The family, Stephen and Fannie, with six of the children (Elizabeth, Mary, William, Eleazer, Ann, and Sarah) were settled in Auburn, Cayuga County, New York during the 1850 Census. Their oldest daughter, Ellen, married on 4 July 1850 and the census enumeration occurred on the 8th of August. The 1855 New York Census still shows the family in Auburn. It appears that the Blackhursts came to Michigan in 1859. The 1860 Census shows Stephen and Fanny along with the three youngest children, William, Louise, and Sarah living in Sheridan Township, Calhoun County, Michigan. The Blackhurst farm appears to be about four miles north of Albion. So, over the ensuing years various documents indicate they live in Albion and Sheridan (Township). There were some apparent conflicts in the 1860 Census that I addressed here. Stephen Blackhurst died on 24 December 1869 of “Dropsy of the Bowels” (Ascites) in Albion, Calhoun County, Michigan. He is buried at Riverside Cemetery in Albion. 54 years after Stephen Blackhurst’s death, his descendants got together for a family reunion at a park in nearby Jackson, Michigan. See: Blackhurst Family Reunion – 1923 for details. Ellen Blackhurst was born on 19 Oct 1829 in Kingston upon Hull, Yorkshire, England. She died on 17 Feb 1905 in Sheridan Township, Calhoun County, Michigan. She married Henry Clough on 04 Jul 1850 in Auburn, Cayuga, New York. Elizabeth Blackhurst was born on 21 Oct 1831 in Sheffield, Yorkshire, England. She died on 14 Feb 1915 in Calhoun, Michigan. Mary Blackhurst was born on 20 Dec 1833 in Sheffield, Yorkshire, England. She died on 14 Feb 1900 in Springport, Jackson, Michigan. She married Royal Baldwin on 11 Jan 1857 in Calhoun County, Michigan. William Stephen Blackhurst was born on 13 May 1835 in Sheffield, Yorkshire, England. He died on 10 Mar 1914 in Avalon, Livingston, Missouri. He married Emily M Vase on 05 Sep 186417 in Calhoun County, Michigan,Usa. He married Sarah Elizabeth Hinkley sometime between 1875-1886. Louise Blackhurst (aka “Eleazer” and possibly “Louisa”) was born on 14 Aug 1840 in England. She died on 17 Mar 1927 in Albion, Calhoun, Michigan at the age of 88 Years, 7 Months, 3 Days. She married Samuel Sanders about 1862. She married Champion Eslow on 03 Sep 1872 in Albion, Calhoun, Michigan. She married Francis Magennis on 15 Aug 1882 in Albion, Calhoun, Michigan. She married Charles Henry Peck19 on 21 Dec 1898 in Albion, Calhoun, Michigan. It was the 4th marriage for Louise and the 2nd marriage for Charles. Phoebe Anna Blackhurst was born on 15 May 1842 in Sheffield, Yorkshire, England. She died on 17 Aug 1929 in Chicago, Cook, Illinois. Sarah H Blackhurst was born on 29 Dec 1847 in Sheffield, Yorkshire, England. She died on 08 Aug 1928 at home at 1456 Lawndale, Detroit, Wayne County, Michigan. Stephen White, Justice of the Peace, performed the marriage ceremony for Sarah and Franklin E Barber on 08 Nov 1869 in Sheridan Township, Calhoun County, Michigan. 1841 England Census, Ancestry.Com, Yorkshire, Kingston upon Hull, Parish of Holy Trinity, Pages 21 & 22. Stephen Blackhurst. 1850 Census (FS) (NARA), Family Search, Stephen Blackhurst – Auburn, Cayuga, New York. Accessed 25 Aug 2013. https://familysearch.org/ark:/61903/1:1:MCT2-GRX. 1855 New York Census, Family Search, Stephen Blackhurst – Auburn, Cayuga, New York. Accessed 25 August 2013. https://familysearch.org/ark:/61903/1:1:K675-B3M. 1860 Census, Family Search, Stephen Blacklin – Sheridan, Calhoun, Michigan – Line 7. Accessed 25 August 2013. https://familysearch.org/ark:/61903/1:1:MWDJ-W8X. 1870 Census (FS) (NARA), Family Search, Fanny Blackhurst – Sheridan, Calhoun, Michigan, Page 30, Line 24. Accessed 22 Feb 2016. https://familysearch.org/ark:/61903/1:1:MHHF-4GM. 1870 Census Mortality Schedule, Ancestry.Com, Stephen Blackherst [Blackhurst] Dec 1869. Death 24 Dec 1869, Sheridan, Calhoun, Michigan Age 70, Farmer. Find a Grave, Find a Grave, Elizabeth “Bessey” Blackhurst Earl (1831 – 1915). https://www.findagrave.com/cgi-bin/fg.cgi?page=gr&GRid=10685269. Find a Grave, Find a Grave, Ellen Blackhurst Clough – Memorial 0125426. https://www.findagrave.com/cgi-bin/fg.cgi?page=gr&GRid=10125426. Find a Grave, Find a Grave, Louise Blackhurst Peck – Memorial 10477818. No Marker. https://www.findagrave.com/cgi-bin/fg.cgi?page=gr&GRid=10477818. Find a Grave, Find a Grave, Phoebe Ann Blackhurst Brownell (1842-1929). https://www.findagrave.com/cgi-bin/fg.cgi?page=gr&GRid=12444623. 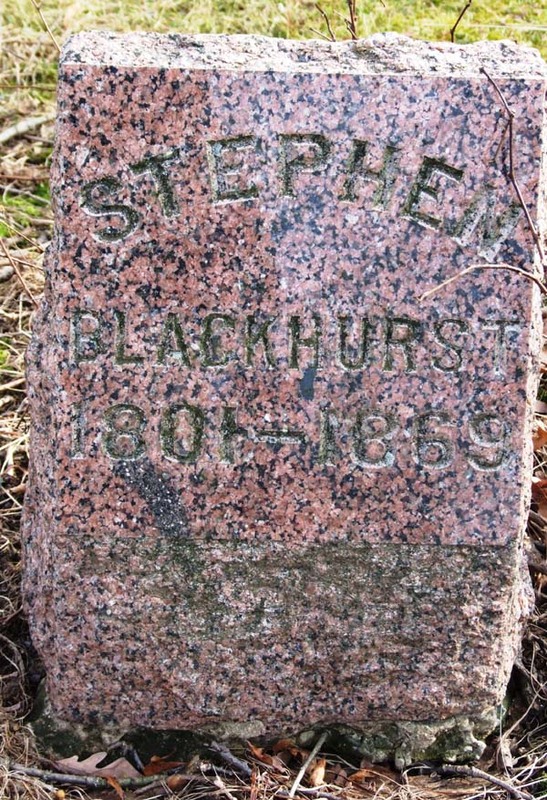 Find a Grave, Find a Grave, Stephen Blackhurst, Jr. (1801-1869). https://www.findagrave.com/cgi-bin/fg.cgi?page=gr&GRid=12173138. Find a Grave, Find a Grave, William Stephen Blackhurst (1835 – 1914). https://www.findagrave.com/cgi-bin/fg.cgi?page=gr&GRid=37112169. Michigan Death Records, 1897-1920, Seeking Michigan, Bessey Earl (1831-1915) [Blackhurst]. http://seekingmichigan.contentdm.oclc.org/cdm/singleitem/collection/p129401coll7/id/249648/rec/1. Michigan Marriage Records – Calhoun County, Files (Personal), Franklin Barber – Sarah H. Blackhurst – 1869. Record Number 699, Book 1, Page 47. Trace Stephen Blackhurst’s life in England before his coming to the United States. One of the interesting images from the New York Times of 7 April 1918 is an image of Lady Drogheda. Her 1918 flight over London, dropping leaflets urged people to buy British War Bonds, is reminiscent of Donna flying over Revere Beach three years earlier dropping banners and tickets for the movie she was in. (See Donna Montran Biplane Flights – 1915 for details). Apparently, this mode of advertising was quite the thing in the day. Of course, I can’t imagine anyone doing it today as it would be viewed upon as littering. Times have changed so much over the past 100 years. 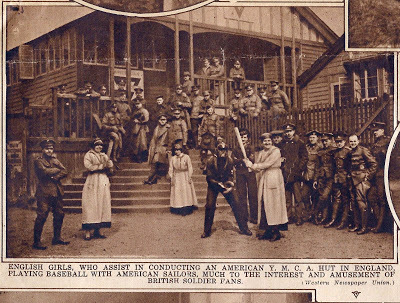 Another fascinating image of the period is one showing English Girls, playing baseball at a Y.M.C.A. Hut, in England. American Sailors are looking on to help and British Soldiers are watching from the background. I wonder if the women had ever seen a Baseball game before. Although baseball was introduced in England in 1890, it fell into low attendance during subsequent years and then dissolved altogether in 1898. American baseball wouldn’t return to England until in the 1930s. When the Great War began, the Y.M.C.A. launches a program of morale and welfare services that served 90% of the American military forces in Europe. It was an amazing organization and aided the servicemen of the Great War so much. I too remember the Armed Forces Y.M.C.A. being an important part of my military life. When I was stationed at Treasure Island, in San Francisco, I would take the bus into The City. From the bus station, I would walk down to the Armed Forces YMCA, which was only a few blocks away. There, I played table tennis and met the girls at the occasional dance. It was a great place to hang out and a pleasant respite for the homesick sailors. Thank you to all of the volunteers at Y.M.C.A. facilities that have brought joy, happiness, and play into the lives of so many soldiers, sailors, and marines. Well done.When the Great War began, the Y.M.C.A. launches a program of morale and welfare services that served 90% of the American military forces in Europe. It was an amazing organization and aided the servicemen of the Great War so much. This week, I continue with images from the New York Times. This time, they are not from “over here” nor from “over there,” but rather, they are from “somewhere” else — in this case from England. An image of the entire page in context is available from The New York Times pages on Newspapers.com. My images for this date are here. Blackhurst a rare name in my family tree. Blackhurst is a surname based upon habitation, that is to say it is based upon where a person lived or came from. In this case “Blackhurst” derived from Old English blæc meaning ‘black’ and hyrst meaning ‘wooded hill’. Back in 1840, there doesn’t appear to have been any families with the Blackhurst surname in the United States. [ii] By 1880 there were only 62 families in the United States and 11 of them were in New York. The 1920 Census reports only 74 Blackhurst families in the entire nation. Blackhirst – primarily in the United States. Blokhorst – primarily in the Neatherlands. #124 – Stephen Blackhurst 1775-1845 – 4th Great Grandfather. #62 – Stephen Blackhurst (1801-1969) – 3rd Great Grandfather. Immigrant Ancestor. #31 – Sarah H. Blackhurst (1847-1929) – 2nd Great Grandmother. #15 – Ida Mae Barber (1875-1953) – Great Grandmother. #7 – Madonna Mae Montran (1893-1976) – Grandmother. #3 – My mother (Living). My records show 52 known, direct, descendants of Stephen Blackhurst over ten generations. Of my 99 known ancestors, that I have identified, three have the Blackhurst surname. Ancestry DNA indicates that I have one person, with a DNA Match that has Blackhurst in their family tree. Unfortunately, it is only 7.2 centimorgans on one DNA Segment and is likely a 5th to 8th cousin. She does have ancestors from Lancashire, England, which is next to Yorkshire, England where my Blackhurst ancestors came from but a genealogical connection isn’t evident. If you have Blackhurst ancestry, why not check out Ancestry DNA and see if you are related to one or both of us? 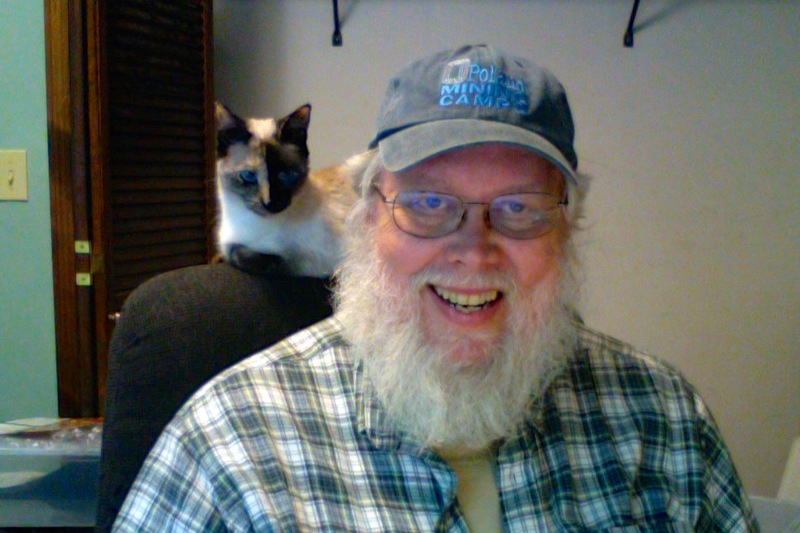 Author Don TaylorPosted on July 9, 2016 January 5, 2019 Categories Brown, Surname SaturdayTags Blackhurst, England, Stephen Blackhurst, Surname Saturday1 Comment on Blackhurst a rare name in my family tree.